The Hilton Garden Inn Anchorage hotel looks forward to welcoming attendees and exhibitors of the Great Alaska Aviation Gathering this May. The Hilton Garden Inn Anchorage hotel excitedly awaits the arrival of the 2014 Great Alaska Aviation Gathering, happening May 3rd and 4th at the FedEx Hangar in Anchorage, Alaska. This show, now in its 17th season, expects over 23,000 pilots and aviation enthusiasts to participate in two days of presentations, demonstrations and education. Alaska has more pilots and aircraft per capita than anywhere in the world and this show is not to be missed. Exhibitors and attendees of the show are encouraged to book their hotel accommodations while there is still availability. Make a reservation today at the Hilton Garden Inn Anchorage to experience all this award-winning hotel has to offer. Reservations can be made by calling the hotel directly at (907) 729-7000 or by visiting the hotel’s website. 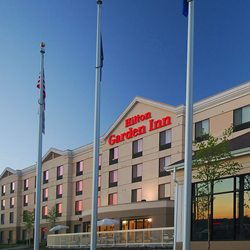 The Hilton Garden Inn Anchorage hotel is an ideal destination for business and leisure travelers alike. Guests enjoy easy access to recreational activities like golfing, hiking, fishing as well as local dining and shopping. The hotel is also in close proximity to British Petroleum-BP Exploration, Providence Alaska Medical Center, ConocoPhillips, Arctic Slope Regional Corporation, Alaska state government offices and JL Tower. Hotel amenities include a free shuttle service to assist with Anchorage transportation needs, plush bedding, flat-screen HD televisions with premium channels, free high-speed Internet access, flexible event spaces, indoor pool and whirlpool, 24-hour business center, and on-site fitness facility. The Hilton Garden Inn Anchorage hotel is proudly managed by Stonebridge Companies in Denver, CO. Founded in 1991 by Navin C. Dimond, Stonebridge Companies is a privately owned, innovative hotel owner, operator and developer headquartered near Denver, Colorado. The company’s current portfolio entails 45 hotels with over 7,000 rooms nationwide. This diverse portfolio includes select-service, extended-stay, mid-scale and full-service hotels in markets throughout the U.S. For detailed information, visit our website at http://www.SBCOS.com.